Curry. The New Disease Fighter? One of my clients recently asked me about the health benefits of turmeric, a popular Indian spice. I’ve read many new studies about the main compound in tumeric called curcumin, but I think this article written by Christina S.N. Lewis highlights much of the current fascinating discoveries. Copyright (c) 2005, Dow Jones & Company, Inc.
New evidence suggests a common Indian spice is a potent antioxidant that can prevent many diseases. The spice, turmeric, a key ingredient of curry, has been used medicinally for hundreds of years. But scientists are starting to systematically explore the sweeping qualities of the bright-yellow powder. The U.S. National Institutes of Health has four clinical trials registered that are recruiting patients to test curcumin for pancreatic cancer, multiple myeloma, Alzheimer’s and colorectal cancer. Curcumin is “definitely on our radar screen,” said Niles Frantz, a spokesman for the Alzheimer’s Association in the U.S., when asked about a recent Alzheimer’s trial. 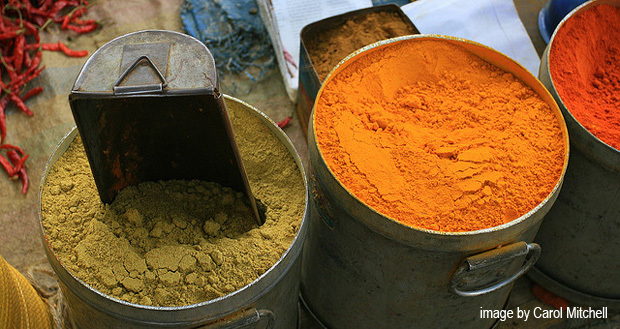 Curcumin is cheap, widely available and has no known toxicities. Studies have shown that it has anti-inflammatory and cholesterol-lowering properties. And it is a potential Cox-2 inhibitor, the same mechanism targeted by Merck & Co.’s Vioxx painkiller and a promising anticancer sign. 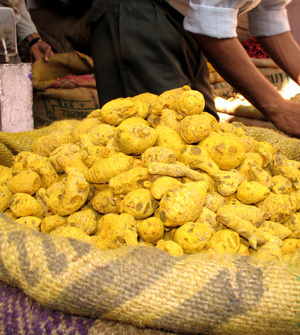 Interest in curcumin was piqued after scientists realized that people living in India had lower rates of certain cancers. Researchers theorized that eating curry, which is liberally spiced with turmeric, could be the explanation. Curcumin isn’t related to cumin, a spice commonly associated with Moroccan cooking. In India, tradition calls for a bride to cover herself with turmeric to prevent wrinkles; some mothers will mix the powder with milk to ease an upset stomach. Johnson & Johnson sells a turmeric Band-Aid in India because the powder is reputed to help heal wounds. Interest in curcumin appears to be increasing for several reasons. For one thing, alternative medicine has become more acceptable to mainstream doctors. Also, in 2002, the NIH’s National Center for Complementary and Alternative Medicine began actively soliciting grant proposals for preliminary trials in natural therapies, making it easier for researchers to find funding. Consumers also may be ready to try something new. Several negative studies have affected sales of vitamin E, the most well-regarded antioxidant. Its sales declined about 35% in the past year, according to Grant Ferrier, editor in chief of Nutrition Business Journal. By contrast, sales of turmeric-related dietary supplements increased 35%, Mr. Ferrier said. But curcumin still represents only $15 million of sales in the U.S., a drop in the bucket compared with the $20.3 billion nutritional-supplement industry. “From the data that I’ve seen in the laboratory, curcumin could be very potent in terms of killing tumor cells,” said Razelle Kurzrock, an investigator at M.D. Anderson Cancer Center in Houston, who studies curcumin and has applied for a patent on an injectable anticancer curcumin compound. Research activity has exploded. A search of the U.S. National Library of Medicine reveals that 256 curcumin papers were published in the past year, compared with 94 published studies five years ago. Though curcumin looks promising, it still has to make the leap from promising data to successful clinical trials. “Something can look very good in the laboratory and still not do much for patients,” Dr. Kurzrock said. Even if science bears out curcumin’s effectiveness, this doesn’t mean eating more curry necessarily will improve your health, since a lot of curcumin is needed to reap anticancer benefits, doctors say. In the Alzheimer’s study at University of California, Los Angeles, for instance, patients were given daily four-gram doses, roughly the equivalent of about 120 curry dinners, according to its lead investigator. Already, some entrepreneurs are trying to cash in on curcumin’s promise. Last month Pure Prescriptions Inc., an Encinitas, Calif., online retailer specializing in natural substances, launched a curcumin-based supplement, marketing it as an all-purpose antioxidant. A biotechnology venture called Curry Pharmaceuticals, in Research Triangle Park, N.C., is seeking funding to develop curcumin compounds and to research a curcumin cream to treat psoriasis and other skin disorders. Madalene Heng, a doctor at the Center for Dermatology Care in Thousand Oaks, Calif., already sells such a cream, called Psoria-Gold. Martin Yarnell, a 41-year-old lawyer from Oak Park, Calif., said the product has nearly eliminated his lifelong psoriasis. True..our grandma was always right, turmeric is being used for hundreds of years and still being used as a beautifying in countries like Nepal and india. turmeric has been around forever, and its medicinal properties have been known forever…thanks for writing about it though.. Thanks for your note! I disagree, many Americans have never heard of turmeric although they’ve certainly tasted it, and are not aware of the healing attributes of food. It’s always been a super spice in Ayurvedic and Indian cooking though… so you’re right on that note.